Description: Medium-size ferns that can grow more than 3 feet tall. 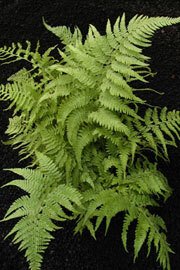 Fronds are very soft and usually light to medium green. Individual blades and the midrib are usually hairy, as described by its Latin species name, striga, which means short bristlelike hairs. Distribution: Palapalai is an indigenous fern, meaning it is native to Hawaii but also other places. Here, it is found on all the main islands, usually in mesic forests but occasionally in dry or even wet forests, from near sea level all the way up to about the 5,000-foot elevation. Cultural uses: Palapalai is an important plant in Hawaiian culture, primarily for hula. It is one of the plants sacred to Laka, the goddess of hula, and is used to adorn the hula altar and dancers. It is highly prized for making leis. Many songs and chants also refer to palapalai for its beauty and cultural importance. Landscape uses: For years, palapalai has been sold in stores and used in landscapes throughout the world. Chances are these are not the varieties native to Hawaii; they most likely came from Asia. Even the ferns normally sold here as palapalai are propagated on the mainland or sometimes Mexico, then shipped to nurseries in Hawaii. Only recently have Hawaiian varieties been grown, thanks to the fern lady Kay Lynch, who micro-propagates them from meristem cells (the most actively dividing cells on a plant) of native plants. These ferns are available at the Home Depot native plant section for about $7. Plant in any semishaded area, such as under the eve of your house or at the base of a larger tree. They can even be kept in a bright room with daily misting. Daily watering is OK once the fern is planted in the ground. Routine application of compost, mulch or fertilizer will keep it looking full and green. Keep it in a more protected area, as the plant can be prone to wind damage. Rick Barboza co-owns Hui Ku Maoli Ola, a native Hawaiian plant nursery, with Matt Schirman. Contact him at 259-6580 or e-mail Rick.ck.barboza@gmail.com.